One of the most common remedies used for a blocked nose is the nasal spray. However, there are many different types of nasal sprays available, and they all work in different ways. Antihistamine nasal sprays are sprays that target one of the main causes of allergic reactions and symptoms: an excess amount of histamine, which is meant to fight germs and "intruders" into the body, but sometimes causes symptoms such as a blocked nose. The only brand of antihistamine spray that is in widespread use is Astelin, which is available by prescription only. It is not meant for long-term use. Since antihistamine medications are effective against allergies and related symptoms, this type of spray would not be effective if the cause of your blocked nose is a virus, bacteria, or a structural issue. Unmediated sprays, such as saline sprays and nasal salves, can help to clear and relieve some of the effects of a blocked nose. Saline sprays are the same sort of method as the Neti Pot, only in a smaller volume. These are safe for long term use and can be used regardless of the cause of the blocked nose. 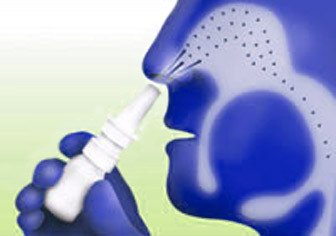 Steroid nasal sprays are used to reduce the swelling in the membranes of the nasal cavity. Some well known sprays that contain steroids are Nasonex, Flonase, and Nasacort. They take a week to ten days to be effective and are formulated for long term use and prevention of nasal blockage. These medications are typically used for those who have a chronic problem with nasal blockage, since it takes so long to be effective. Wait, aren't steroids bad?! No! Steroids are often used for medical reasons and have many benefits, such as their assistance in reducing the swelling of nasal cavity membranes over a long period of time. Although some steroid medications can cause side effects such as a suppressed immune system, this is uncommon in most patients, and is considered and monitored by the doctor who prescribes the medication. Steroids are only "bad" when they are abused, and the amount used in these medications is not enough to cause harm or even bring rise to the possibility of abuse. Topical decongestant sprays are the most commonly used, since they are available over the counter and bring almost instant relief to a blocked nose. Some well known sprays are Afrin and Vicks Sinex. These sprays are advised for short term use, since long term use can cause the membranes of the nasal cavity to become more irritated, and the nasal blockage can be worse than before. This type of medication would not be effective in those who have a chronically blocked nose, since long term use can cause aggravation of the condition. So... should you use a nasal spray or not? Most doctors agree that a combined use of these different types of nasal sprays is most effective in treating those with a blocked nose. Remember, only unmedicated and topical decongestant sprays are available without a prescription, and overuse of the topical decongestant spray can do more harm than good.